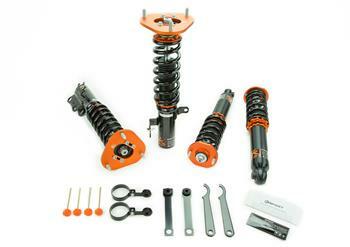 The Ksport Version DR coilover system is specially engineered for drag racing applications. With proven performance on the drag strip, the Ksport Version DR system will reduce your E.T. and 60 ft times. The DR system is built on our race proven Version RR coilover, with internal changes to accomodate the rigors of drag racing. All Version DR drag racing coilovers will be custom valved for drag racing, with appropriate spring rates chosen to maximize traction and regulate weight transfer. As with all Ksport coilovers, the Version DR Drag Race coilover allows for 36 levels of damping adjustment, spring pre-load adjustment, and height adjustment without sacrificing shock travel. The electro-plated steel shock bodies resist rust and corrosion, and all mounts are constructed from 6061-T6 aluminum for superior strength.